Advances in Concrete Slab Technology documents the proceedings of the International Conference on Concrete Slabs held at Dundee University on April 3-6, 1979. This book discusses the influence of steel fiber-reinforcement on the shear strength of slab-column connections; sulfur-treated concrete slabs; yield line analysis of orthotropicaly reinforced exterior panels of flat slab floors; and behavior of flat slab/edge column joints. The design of multiple panel flat slab structures; structural behavior of floor slabs in shear wall buildings; shrinkage and cracking of concrete at early ages; and slab construction for HAB system modules are also elaborated. 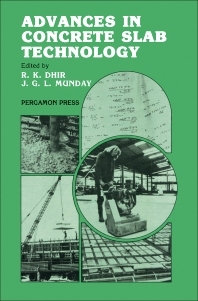 This text likewise covers the direct finishing of concrete slabs using the early age power grinding technique; application of vacuum dewatering to in-situ slab production; retexturing of concrete slabs; and fatigue resistance of composite precast and in situ concrete floors. This publication is a good reference for students and individuals concerned with the practices and research relating to slab technology.